In a ceremony last month, Yutaka Katayama has finally been inducted to the Japan Automotive Hall of Fame at the age of 99. Known as Mr. K to his fans, he presided over Nissan USA during its formative years in the 60s and 70s, largely responsible for making it the car company that it is today. Katayama is also called the father of the Z-car for his involvement in developing a sports car for the US market that became the Datsun 240Z. He is also helped build Nissan’s storied reputation in motorsports, having pushed for racing programs that he knew would be key to building a strong following for the marque. It’s great to see such an influential figure finally get the recognition he deserves in his home country. Mr. K was inducted into the US Automotive Hall of Fame in 1998. 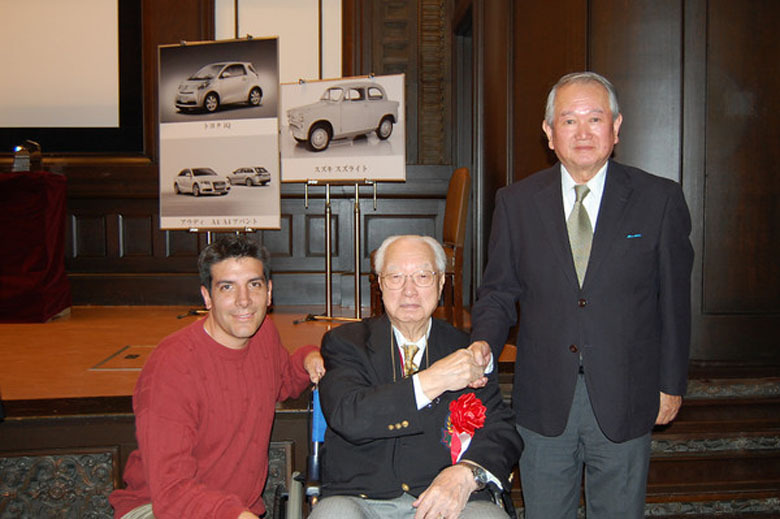 He is shown above with Luis Carriles, Z Car Club of San Antonio (left) and Yoshihiko Matsuo, lead designer on the Fairlady Z project (right). tagged: japan automotive hall of fame, japanese automotive hall of fame, mr k, yutaka katayama. Yay for Mr. K! I never did get an autograph from him…. hope he stops by a So.Cal event soon! Mr. K is a living legend. It’s hard to believe it took this long. I know, right? Even the US hall of fame inducted him 10 years ago. With all due respect, there was no “240Z project”. Matsuo san was head of the design team that were working on the project that would become known as the S30-series Z range. The “Datsun 240Z” name was given to the first Export market ( both LHD and RHD ) variants of that range, but the Fairlady Z, Fairlady Z-L, Fairlady Z432 and Fairlady Z432-R ( as well as the variants not seen until later, such as the 2/2 body style and the 240ZG ) were all part of the design and engineering processes that Matsuo was overseeing. You’re right! Pardon my Ameri-centric shorthand. I’ll change it from “240Z project” to “Fairlady Z project”. I hope he is able to come to the ZCCA convention in San Antonio this September. He would be 100 years old. Thank You! MR. K for the Z car.